I was hired by the Patient Education department at Memorial Sloan Kettering Cancer Center to play two key roles in re-designing the education experience for their bone marrow transplant (BMT) patients. The goal was to improve upon the existing binder of information, a 100+ page combination of fact sheets, instructional booklets and information cards. My major role was to research with stakeholders to research the BMT timeline. 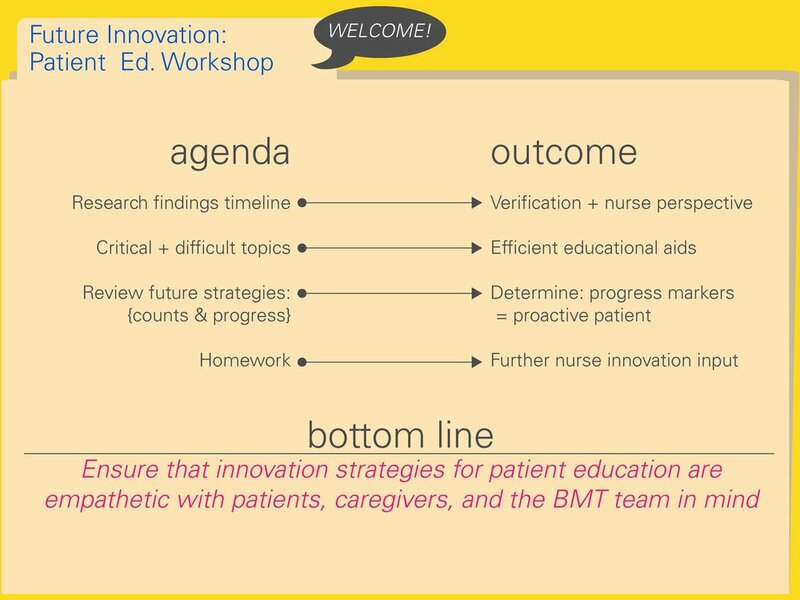 In the research consolidation phase I clustered the findings of patient education materials into new topic categories that were reflected the the education needs at that stage of the process. After gathering the timeline of events and educational stages I led a stakeholder workshop to ensure that future stages would have both the outpatient and inpatient staff on the same page re: patient education. Together we concluded areas to target education, and brainstormed strategies for improvement such as an interactive chart for blood counts that would keep stakeholders on the same wavelength.